The journal serves as a forum for the exchange of scientific information in the form of original and high quality papers in the field of transplantation. Clinical and experimental studies, as well as editorials, letters to the editors, and, occasionally, reviews on the biology, physiology, and immunology of transplantation of tissues and organs, are published. Both full-length articles and short papers are included in the journal. Publishing time for the latter is approximately six months, provided major revisions are not needed. The journal is published in yearly volumes, each volume containing twelve issues. Papers submitted to the journal are subject to peer review. 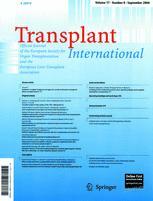 "Transplant International" is the official journal of the European Society for Organ Transplantation (ESOT) and the European Liver Transplant Association (ELTA).